This is a 1933 Packard 1002. According to Barrett-Jackson only 1,099 of these cars were produced. This number is confirmed in Encyclopedia of American Cars by the Auto Editors of Consumer Guide®. However, 11 body styles were available for the 1002 model in 1933 so the number of 2-door, 5-passenger coupes like this one that were sold is far smaller. This car still has its original drivetrain, which was restored about 15 years ago. The first owner acquired the car in July of 1933. The 1002 was powered by Packard’s straight-eight engine of 320 cubic inches that produced 120 HP. The 5-passenger coupe had a price of $2,980. As a comparison, the most expensive 1933 Chevrolet cost $565. At the auction the Packard 1002 hammered at $65,000 meaning the buyer paid $71,500 all in. As I have written before I had no interest in cars of this era as recently as five years ago. That has changed for sure. While I don’t know if I would purchase a classic pre-war car if I won the lottery, I don’t know that I wouldn’t, either. Speaking of automobile auctions, I have often wondered what is the ratio of the median sale price to the average sale price. Well, at the Mecum auction in Arizona in March the median was 65% of the average. I have no idea whether or not the fact that most lots at Mecum are offered with a reserve changes that ratio. About 60% of the offered lots were sold. From topclassiccarsforsale.com a picture of a 1967 Buick GS convertible. This lot—once again, Mecum does not allow online photos of its lots to be captured so this is not the actual auction car—did not sell with a high bid of $20,000. Buick produced 2,140 of these cars for model year 1967 which had an MSRP of $3,167. 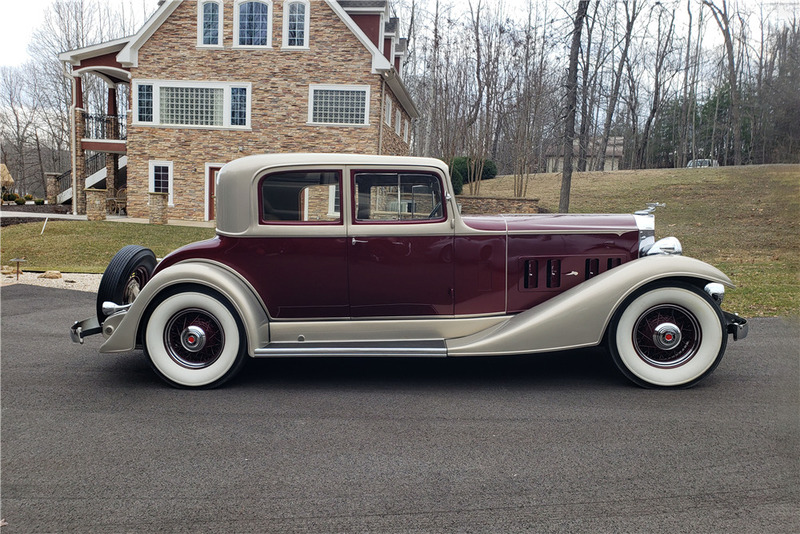 That price is not much more than the original price of the 1933 Packard sold yesterday at the Barrett-Jackson auction. The 1967 Buick GS had a 400 cubic-inch V-8 rated at 340 HP/440 LB-FT of torque. Shame on me for not noting the end of the first work week as a retired person for my best friend, Dr. Zal. May you have many, many weeks in retirement! The gracious and beyond gorgeous Cristy Lee re-tweeted my tweet and I received dozens of likes. Of course, I wish people would follow through, find the Disaffected Musings link and read/follow this blog. One step at a time, I guess. 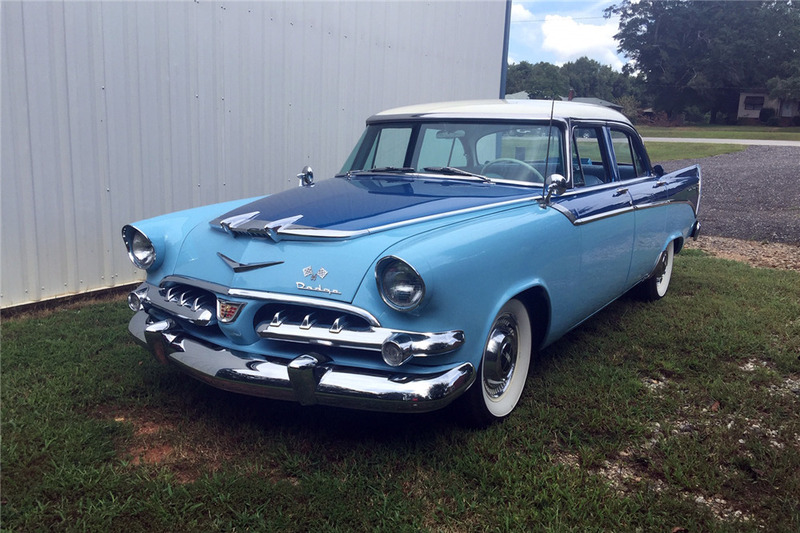 From the Barrett-Jackson website a picture of a 1956 Dodge Custom Royal Lancer D500 that sold on Thursday for $19,250 all in. Not sure why the car is labeled as a “Custom” as my understanding is that it either has original or NOS parts. (NOS = New Old Stock) It has been repainted, but in its original colors. I’m not a big Mopar fan, but this car “speaks” to me and I think was well-bought at less than $20,000 all in. Sorry, but something copied from Twitter ruined the spacing for the rest of the post. Although I awoke this morning without a fever for the first time since before receiving the Shingrix vaccine last Saturday, I still don’t feel well. I am very weak and fatigued. Anyway…NBCSN televises the Mecum auctions, both live and in reruns. Since Mecum holds 10+ auctions a year, it is easy to find one being televised, assuming one has NBCSN on their TV package. Velocity televises the Barrett-Jackson auctions. Barrett-Jackson only has four auctions a year and Velocity does not show reruns very often. My wonderful wife and I have attended auctions from both companies. In person, the Barrett-Jackson experience was superior, in our opinion. There was more excitement in the crowd and the pace kept the action moving. On TV, however, I prefer watching the Mecum auctions. The hosts are knowledgeable, don’t take themselves or the auction too seriously and seem to be having a good time. The Mecum telecasts are fun to watch. In my opinion, the Barrett-Jackson telecasts are stuffier and the hosts don’t seem to be having as much fun. Despite the presence of the amazingly beautiful Cristy Lee (who isn’t on-screen very much), the telecasts often display a lack of energy. Of course, all of this is just my opinion. Do any of you watch car auctions on TV? If so, what are your thoughts? You can figure out what this article is about. The writer, of course, had to insert the obligatory “while we still love manuals.” Manual transmissions are like dodos; they’re going extinct. However, because so many have been made their road to extinction will be slow.